When trail advocate Tony Goodwin looks at the railroad tracks heading west from Saranac Lake, he imagines a recreational trail teeming with cycling tourists in the summer and snowmobilers in the winter. Railroad aficionado Jim Ellis looks at the old Adirondack line and sees a scenic railroad carrying visitors through the dense forests of upstate New York. “You just would marvel at the wilderness and the wetlands and the beautiful ponds and lakes and wildlife,” he suggests. These two very different visions are fueling a heated debate about what to do with the mostly defunct railroad line that once carried as many as 20 passenger trains every day into the Adirondacks. Goodwin belongs to a coalition called the Adirondack Recreational Trail Advocates (ARTA) that wants to rip up 81 miles of tracks from Old Forge to Lake Placid and replace it with a crushed-stone trail for bikes and snowmobiles. He’s been lobbying since the 1980s to replace the rails with trails. Ellis sits on the board of the Adirondack Railway Preservation Society, a nonprofit that has worked for decades to reinstate passenger service along the scenic rail line. 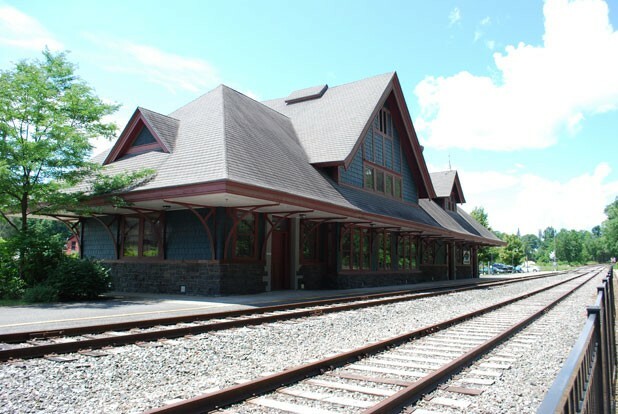 Since 1974, New York State has sunk $32 million into renovating several historic train depots and upgrading two sections of track: a roughly 9-mile stretch from Saranac Lake to Lake Placid that was revived for the 1980 Olympics; and a 24-mile segment from Utica to Thendara. Today, the Adirondack Railway Preservation Society operates short passenger trips between May and October on those restored sections. The trips have themes such as “Bandit Train,” complete with a staged train robbery, and “Family Fun Days” with face painting. On other sections of track, though, the railroad ties are level with the earth, and parts of the railbed have eroded away. A few ties are rotted and decayed, making the route all but impassable for a train. That makes the rail line a perfect candidate for conversion to a recreation trail, says Goodwin, an enthusiastic outdoorsman who runs two trail maintenance organizations. “We see this really as the missing link of Adirondack trails,” he says. To date, more than 6000 people have signed a petition backing ARTA’s bike-trail plan. A commissioned report from the Rails-to-Trails Conservancy suggests that the salvage value of the rails would more than cover the cost of constructing the first 34-mile section of trail between Lake Placid and Tupper Lake. The report estimates the trail could attract as many as 244,000 visitors a year, which would impact the local economy to the tune of $19.8 million. But in a fight that’s as much about small-town politics and local personalities as resource management, the two sides can’t agree on much — especially cost estimates for refurbishing the entire rail line. The North Country Chamber of Commerce sponsored a study that found restoring passenger service would cost $16 million — roughly the same figure the state came up with in the 1990s. Goodwin scoffs at that number, saying estimates from New York transportation officials put the cost closer to $43 million. Ripping out the tracks is controversial in a region that has the railroads to thank for its initial development. The expansion of railroads in the remote region started after the Civil War, according to Mike Kudish, a professor emeritus of forestry at Paul Smith’s College who has written extensively about railroads in the Adirondacks. Kudish says the rail line served two important purposes: hauling lumber or mined materials from the resource-rich region to the cities; and transporting vacationers from the cities to tourist destinations in the North Country. At the time, the Adirondacks were one of the last unexplored regions of the northeast — dense, wild and difficult to traverse. But as new railroads cut paths through the mountains, wealthy tourists from New York City and other southern cities flocked to the region’s great camps and new hotels. The recreation boom was well under way when William Seward Webb — of Shelburne Farms fame — built the Adirondack line in 1892. The tracks stretched 118 miles through the Adirondacks. Kudish, who owns a massive collection of 19th- and 20th-century railroad timetables, estimates that railroad travel into the region peaked around 1912. But the rail boom was short lived. By the 1920s, the number of trains began dropping off. By the 1950s and ’60s, most passenger service into the region had ceased. Sixty-one years after it opened, the Saranac Lake depot closed its doors. Today the line is wholly owned by the state of New York — which has the final say over its future. The Adirondack Railway Preservation Society leases the rail line for $1 a year to operate its passenger trains. The group is also paid an average $157,000 a year from the state to maintain the tracks. Ellis says a revived Adirondack line could be expanded beyond tourism to serve commercial freight, too — a cherished hope in Ellis’s hometown of Tupper Lake, which saw its last factory shuttered in 2009. He points to a 30-mile section of rail in the eastern Adirondacks — known as the Tahawus line — that will soon be used to haul out tailings from the Tahawus mine works. And he is skeptical of a recent alliance between trail advocates and snowmobilers, theorizing that “as soon as they rip up those rails,” environmental activists will invoke the “forever wild” clause of the state constitution to block snowmobilers from using the trail. For his part, Goodwin describes himself as a “rail fan.” But he also calls himself a realist — someone who can appreciate when and where a railroad is a logical solution. The Tahawus line might make economic sense, but he calls the existing scenic railroad a failed experiment. Even rail buffs like Kudish concede the train as it exists today isn’t succeeding — but that doesn’t mean he wants the rails to go. “If the railroad is still there, and the tracks are still there, it should be used as railroad,” he says. Kudish blames the current operators for a lack of ambition and vision. He dreams of chartered trains, a steam engine, educational programs and recreation trips that would drop visitors in remote areas. “The people who want to remove the tracks don’t see it,” he says, but the railroad has plenty of potential — even if it’s untapped. But losing the salvage value of the tracks, plus the difficulty of building a new path alongside the existing rail bed, might make that option cost prohibitive for the trail boosters. Goodwin’s holding on to the dream he’s touted for decades — and that doesn’t include a railroad.